The United Nations Security Council took aim at the self-proclaimed Islamic State’s war chest Thursday, unanimously adopting a resolution to strengthen and expand measures to cut off funds to the terror group. ISIL and ISIS are acronyms for Islamic State. 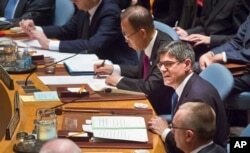 U.S. Treasury Secretary Jacob Lew (r) seated next to U.N. Secretary General Ban Ki-moon, center, addresses the UN Security Council, about cutting funding to IS, Dec. 17, 2015. He also noted the importance of financial intelligence in revealing the structure of terrorist groups, the activities of individual terrorists and their logistic and facilitation networks. The group gets much of its financing - estimates of $500 million so far - from black market oil sales. It also has a lucrative trade in stolen artifacts, extortion and ransom for hostages. Thursday’s meeting was the first time finance ministers sat at the Council table and voted. They unanimously adopted a lengthy and technical resolution that expands the current sanctions framework in place against al-Qaida to focus on the Islamic State group. The resolution requires countries to increase their efforts to choke off funding to the terrorist group, which has seized large areas of Syria and Iraq and is looking to expand its stronghold in Libya. The measure also criminalizes a broader range of financial transactions to tie the hands of terrorists, and it strengthens monitoring of sanction violations.